Muscles are connected to tendons to power animal movements such as running, swimming or flying. During development, these muscle-tendon attachments must be established such that they resist high mechanical forces for the entire life of the animal. 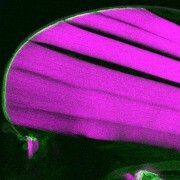 An international research team shows now in fruit flys how a protein controls mechanical stress on muscle-tendon connections. Over 600 professors and more than 5.000 academic employees research and teach within 15 faculties. The Excellence Clusters "Religion and Politics" and "Cells in Motion" bring researchers together from almost every faculty of the University. Aside from these, the University of Münster supports cutting-edge research in a number of internationally renowned fields, such as chemistry, physics and battery reserach as well as evolutionary science. The University of Münster is home to ten Leibniz Prize winners. The University's excellent research quality is further underscored by around twenty ERC Grants (Starting, Consolidator and Advanced) and six Max Planck Research Awards. The University also confers its own highly lucrative awards for outstanding achievement in research, teaching and academics. You have a promising, clearly defined scientific goal, and competent partners have been found. Yet that alone does not guarantee success. Finding the right funding programmes and tapping these through cleverly crafted applications is an essential step in the process. The administration of the University of Münster provides researchers with sound, reliable advice and support. Münster University supports its junior academics as much as it can. Once a supervisor has been found for a doctoral thesis the next step is to apply to the University and enrol. Research Training Groups and funding programmes can help to finance the time when the thesis is being written.